This January, Daksh makes his presence with the aim to disturb Anika’s life once again. Preparations for Priyanka’s wedding are underway and an imposter enters the Oberoi house. Later, the person is revealed to be Mahi, Shivaay long lost lookalike twin brother. Will the family come to know his true identity? Read this month full teasers below on Game Of Love January Teasers StarLife -2019. Svetlana drugs and hides Romi in Omkara’s statue. Anika and Shivaay have a heated discussion on the night before the marriage. Will Romi be found? Svetlana tries to strangle Romi when she calls out for Shivaay. Later, Romi falls down the stairs while trying to escape. 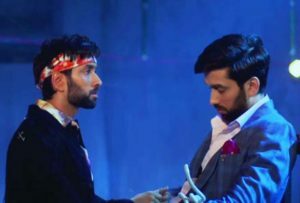 Will Shivaay be able to get the chip from Romi? Mrs Kapoor asks Shivaay to sign the divorce papers. Later, Anika requests Shivaay to stop his marriage with Tia. Why? Anika finds Dushyant’s whereabouts and brings him to the wedding ceremony. How will Tia react on seeing him? Shivaay tears the divorce papers in front of Mrs Kapoor and reveals their plan, leaving Tia stunned. Svetlana vows to destroy the Oberois. Shivaay teases Anika using a knife. Later, his decision to fix Priyanka’s marriage enrages Tej. Kamini and her son, ACP Ranveer visit the Oberois while Sahil returns home. She insists on sending Sahil out. Will Anika tolerate this? Priyanka’s decision surprises Anika. 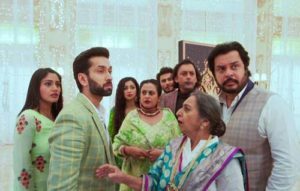 Later, Shivika are in a state of disbelief when they learn about Daksh’s connection with the family! Anika gets restless after meeting Daksh. Later, Shivaay stops Kamini when she tries to serve papaya to Priyanka. Daksh blackmails Shivaay with Anika’s photos and challenges him to save Priyanka’s image. Will Shivaay accept the challenge? Kamini forbids Shivaay and Anika from taking part in a ritual for married couples. Later, Anika gets mad at Shivaay. Shivaay stops Daksh from attending the function. But, Daksh is too clever for Shivaay! Find out what he does. Daksh tries to malign Shivaay and Anika’s relationship in front of the guests and media. Does Shivaay have an answer? Shivaay takes a stand for Anika, while ACP Ranveer takes Daksh into custody. Later, Anika struggles to express her feelings to Shivaay. Will Shivaay understand her love? ACP Ranveer reveals his true face to Priyanka and continues to act innocent in front of Shivaay. Later, the Oberois have some visitors. Who? A transgender cautions the Oberois about the impending danger. Shivaay brings Soumya back to the mansion. Later, Pinki and Shakti decide to call a doctor for Priyanka. The family play a game where the men have to identify their partner’s ornaments. Later, an incident occurs which reminds them of the prediction, while Shivaay has a surprise for Anika. Anika dreams of Shivaay’s plane crashing! Later, she notices changes in Shivaay’s behaviour. Later, Khanna informs the Oberois about Shivaay’s plane crash. Anika faces a bad omen while performing the puja. On the other hand, Shivaay finds himself locked inside a room. Pinki announces that Priyanka’s marriage won’t happen because of Kamini’s demand. Shivaay shocks everyone with his decision. The real Shivaay tries to escape. Fake Shivaay goes to Pinki’s room, at night with evil plans and asks her to keep the jewellery purchased for Priyanka’s marriage. Meanwhile, Shivaay finds an idea to escape from his trap. Shivaay tries to escape from his trap. Fake Shivaay steals the ornaments from Pinki’s safe. Later, Shivaay gets help from a woman. Kamini accuses the Oberois of cheating and gets into a heated argument with Pinki. 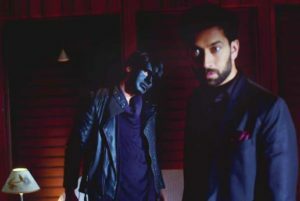 Later, Shivaay has a masked visitor. Anika tries to prove Pinki’s innocence to Kamini and handovers her bangles to her. Later, the fake Shivaay apologises to Kamini. Pinky runs into fake Shivaay and tells him about Kamini threatening her. Meanwhile, the real Shivaay finds his phone! Will he find his way out? Sowmya discovers that Shivaay has been replaced by an imposter. However, Kamini attacks Sowmya to silence her. What is the reason? Anika overhears Shivaay conversing over the phone and decides to test him. Will she get to the truth? Anika follows the imposter and is shocked to find him dancing in a slum. Where is the real Shivaay? Anika is relieved to meet the real Shivaay. Later, Anika and the Oberois organise a Holi party to expose the imposter. Shivaay, along with his family, decides to play along with Mahi to figure out his master plan. Later, Pinky apologises to Anika and accepts her as her daughter-in-law. Mahi agrees to give the interview as Shivaay. Later, he is stunned to know that Shivaay has already given the interview. Was it really Shivaay? Shivaay plans to trap Mahi while he is trying to open the safe using his password. Later, Mahi finds himself in trouble. Kamini and Ranveer torture Soumya. The sangeet ceremony begins and Shivaay puts his plan of trapping Mahi into action. As a part of his plan to kill Mahi, Shivaay makes two similar outfits. Later, he meets Ranveer to discuss his plan. Will Ranveer realise he is the real Shivaay? While the Oberois execute the murder plan, Ranveer stuns everyone with his actions. Later, Soumya calls Anika and informs her about Ranveer’s connection with Mahi. During the sangeet, Mahi blackmails Anika by holding Soumya hostage. Later, Kamini asks Mahi to announce Priyanka’s pregnancy news to everyone. Anika is in a fix about sending Priyanka to the mandap. Later, as Kamini reveals Priyanka’s pregnancy news to the media, Anika has a bigger surprise planned for her. Kamini and Ranveer are stunned when Shivaay explains how the Oberois ruined their evil plans. Do they have any moves left? On Shivaay’s order, commandos arrive at the Oberoi Mansion to catch Mahi. Will Shivaay successfully execute his plan? Anika is treated for the bullet wound she gets when trying to save Shivaay from Kamini. Saahil and Shivaay await her recovery. Kamini ousts Mahi from the house. Later, Mahi confronts Kamini for sending men to attack Shivaay. Shivaay gets beaten up by goons when he comes in search of Ranveer. Mahi rescues Shivaay! Will Shivaay learn about Mahi’s true nature? Pinki complains to Shakti that Shivaay loves Anika more than he loves her. Shivaay’s behaviour makes the situation worse! Pinki is upset with Anika as Shivaay gives her all the credit. Meanwhile, Anika tries to find out about Shivaay’s lookalike. 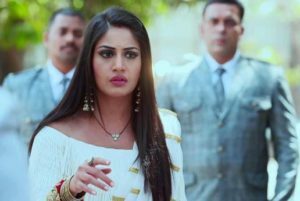 Anika finds Mahi and confronts him while Pinky insists on knowing Anika’s background from Shivaay. Unable to provide an answer, Shivaay is in a dilemma. Anika is curious to find out Mahi’s motive in rescuing Shivaay. Meanwhile, Anika has something shocking to tell Shivaay. 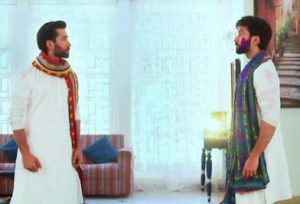 Shivaay tells his brothers that he wants to know about Anika’s family background. Anika becomes furious on hearing this and leaves the mansion. Will they reconcile? Shivaay visits an orphanage to find out about Anika while Anika heads to a hospital. What is she about to discover? On learning that Mr. Bajaj brought Anika to the orphanage, Shivaay assumes that Anika is his grand-daughter. Is she? On learning about Anika’s miserable past, Shivaay is determined to ensure that she has a good life from here on. Meanwhile, Pinki bribes the warden of the orphanage with evil intentions. Anika awaits the DNA test result to know whether Shivaay and Mahi are brothers. She confronts Shivaay for spying on her. Later, things get ugly, when a blunder by Anika lands them in deep trouble. Anika and Shivaay break into a house and spend some fun time inside. Later, they hear a radio announcement. Are they in trouble? Some criminals hold Anika at gunpoint. Anika tries to inform Shivaay that she is in trouble. Will she succeed?